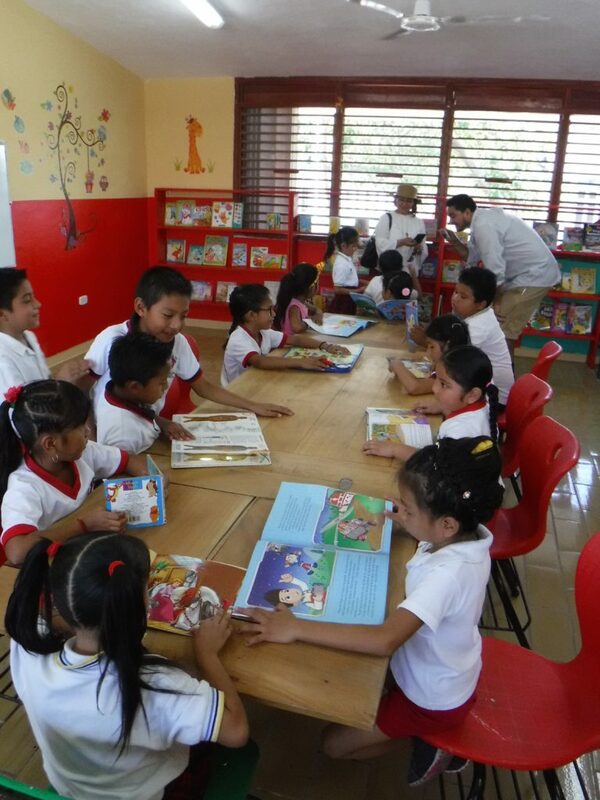 Second Library in Playa Public School Opened!!!!!!!! Girl with Harry Potter in new library setting. 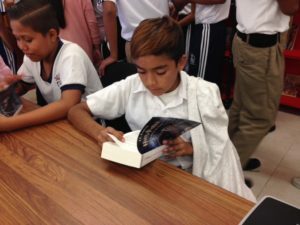 The second Leyendo/Library in a Week library was opened officially Friday, Feb.9 at Ko Oten Kaambal Secundaria in the Nicte Ha neighborhood of Playa del Carmen. 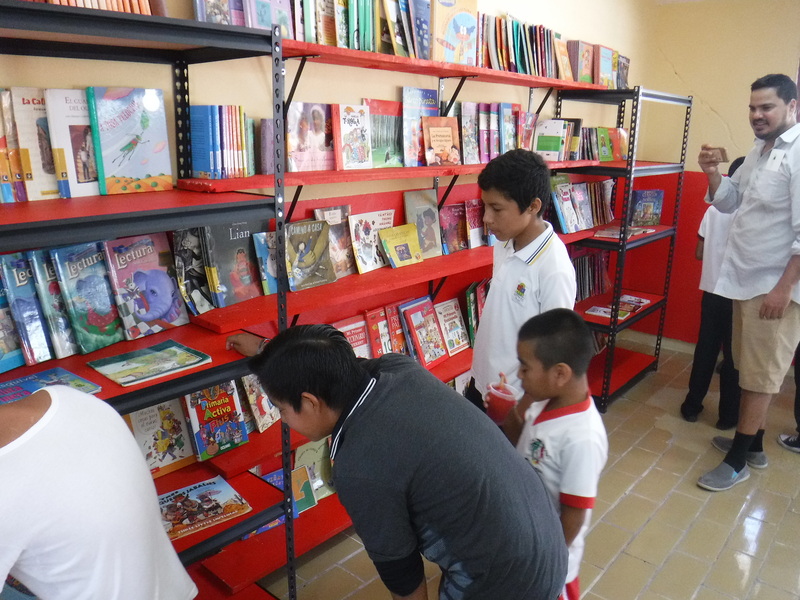 Lots of effort from Leyendo volunteers and school parents made it possible to open this second library in one week. 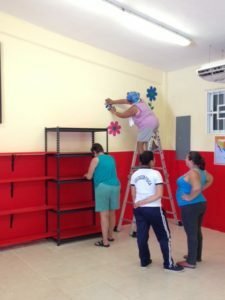 Walls were painted, furniture was assembled, resident very heavy book shelves were reclaimed and pushed into place, floors were mopped and books were placed lovingly on bright red shelves, many from the local organization Libros Libres. Then decorations were created for the walls and put in place. One of the mothers donated a big foami floral creation to hang above the shelves. Decoration cutting by mother volunteers. Part of the construction crew. Then the students poured in one class at a time to explore the library. 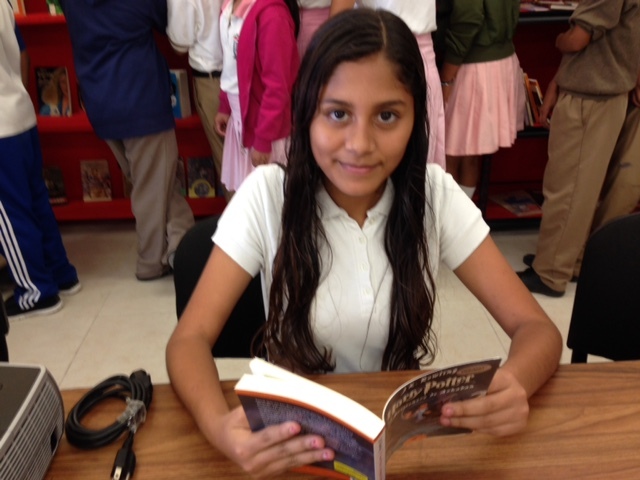 A generous benefactor had donated the entire set of Harry Potter books in Spanish and they were received with joy. Encyclopedias gathered from the Akumal library were perused. One whole cabinet of beginning English language texts were also viewed in hopes of being read soon. The Leyendo crew plan to help with conversational English classes and other activities now that the library is up and running. We have suggested to the director that she find a few students to become “librarians” to handle book loans and manage the everyday responsibilities that it will need. We have also asked the director to ask students which books they would like to have in their new library so we will have a shopping list for Amazon.MX and she will have it for us next week. 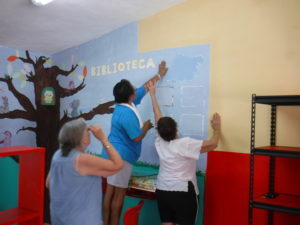 Lots of labor and love have gone into the creation to the new library at Adriana Cupul Itza elementary school in the Nicte Ha neighborhood of Playa del Carmen. Many parents joined Library in a Week director Sultan Utm and Leyendo volunteers for painting bookshelves bright red, sawing corners off to make them fit, attaching brackets to concrete walls to hold up the shelving, decorating library walls and finally cleaning and cleaning to be ready for the Grand Opening. Two days of book placement and more book placement – then the kids arrived. And loved it! No seats left? Find a spot on the floor. The lovely donated table full of readers! A much larger room for the elementary school library. 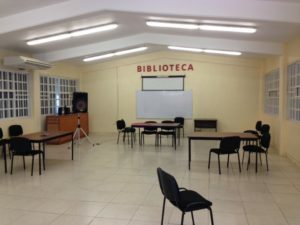 The Leyendo crew visited with the morning director of Adriana Cupul Itza elementary school yesterday and were shown a much larger room that is available for the library. It is a full size classroom, 24 X 24 feet, has four ceiling fans with plans to add air conditioner, but their are three areas where floor tiles have been removed. This needs to be fixed before we start painting and installation of bookshelves. The room is currently used for storage of broken student desks and paint cans but it will be a lovely space when finished. Matt Weatherbee at North American Standards Property Management has donated a long wooden table for use here. The other side of the potential library room. Library in a Week people will arrive Sunday, Feb. 4, and work will begin on this space the next day. Parents and students will be asked to help assuring their ownership of the library. He plans a grand opening later that week. This is all very exciting. 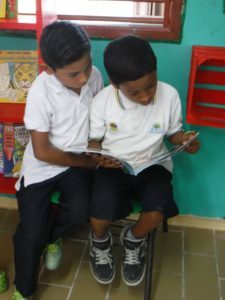 Leyendo has made contacts with several people/organizations to provide more books for these kids to read: an organization called Books for a Better World, a bookstore in Mexico City called Ghandi and a travel agent friend in Canada with school board contacts. More Spanish children’s books are always needed. Help us spread the joy of reading! 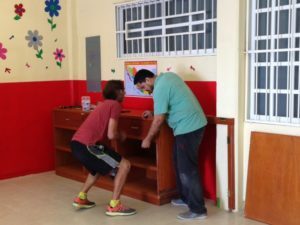 This week the Leyendo group got together to sort through the boxes of books that have been donated, most of which are from Biblioteca Akumal which is downsizing to create a community center. 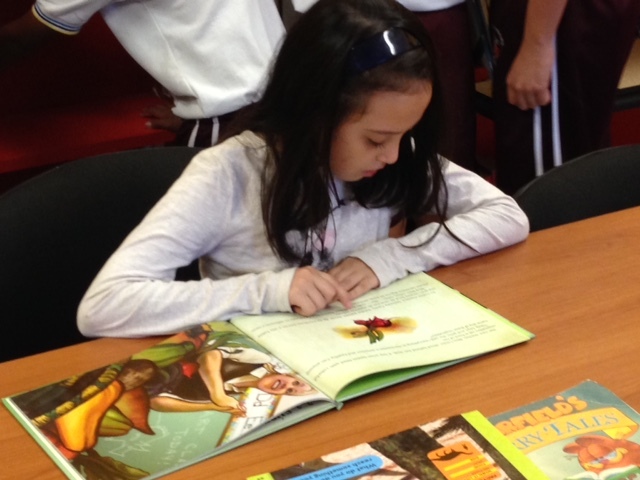 We discovered that the reading level of our treasures was evenly split between primaria and secundaria (elementary and junior high school). So we went looking for one of each. 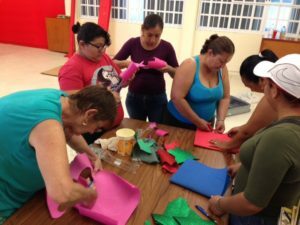 The KKIS Project, Keeping Kids in School, has been helping students in the Nicte Ha neighborhood of Playa del Carmen, Mexico for several years with bags of school supplies for every student in two elementary schools and one junior high. 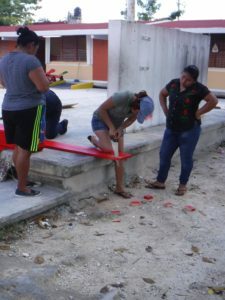 This neighborhood in the very north end of Playa was recommended by the local social service agency which stated that every child in these schools could use help. Leyendo decided to follow their lead and visited with the Directors of Adriana Cupul Itza primaria and Ko Oten Kaambal secundaria. Cleaning supplies fill at least half of the Adriana Cupul Itza space. 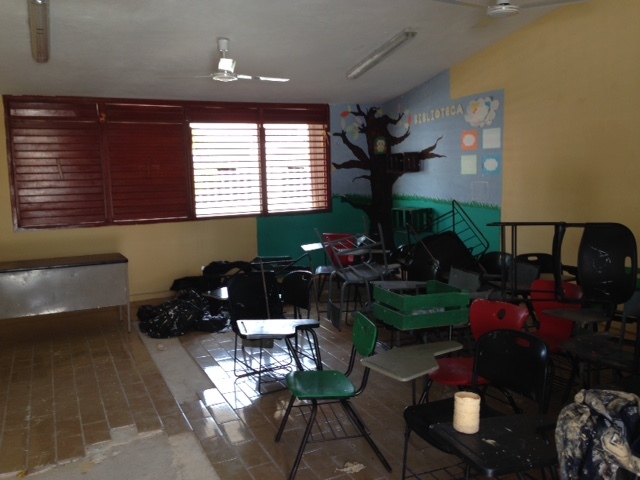 The space available at Adriana Cupul Itza elementary school is small and is currently being used for cleaning supplies and a few books, but is not open for student use. 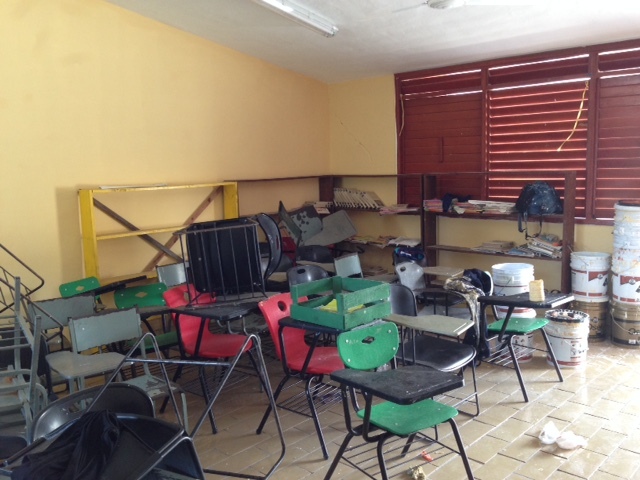 The director promised the space would be cleared for cleaning, painting and shelf building and would be open for both morning and afternoon session student and teacher use. The secundaria, Ko Oten Kaambal, was a bit more ready. 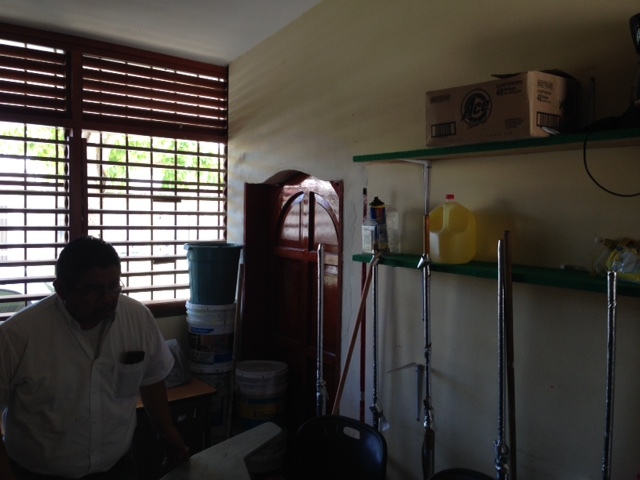 The school was built four years ago and included a huge library room (biblioteca) but no shelving or books. The director said they use the space for meetings and official functions but one third of the room nearest the door could be made into a real library. The long wooden cases pictured are filled with government student work books and would need to stay but could be moved aside. After talking with our partner, Sultan Utm, from Library in a Week a Canadian non-profit organization, it was decided that we could do both. 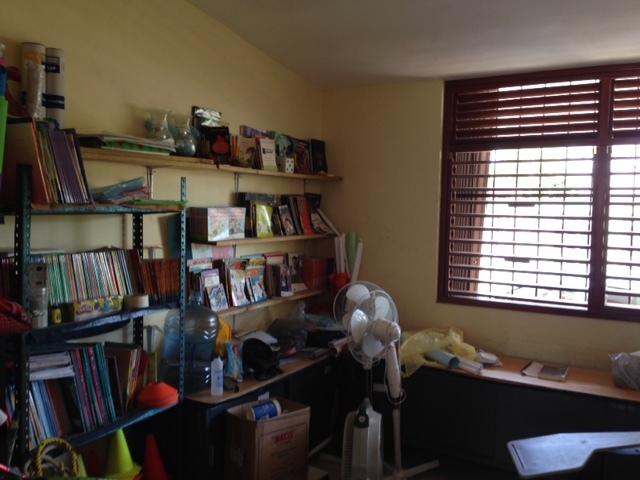 The secundaria space does not need paint, just some bright shelving and lots of books and the primaria has a parent association which will help Sultan with cleaning, painting and construction. Hopefully this will all begin about February 4 or 5 and both libraries will be done in a week. 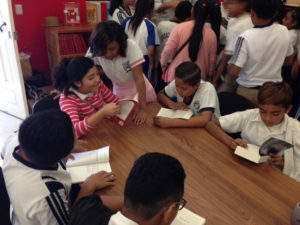 Leyendo plans to follow up with both schools bringing more books as they arrive, arranging events to encourage students to make full use of the libraries and enlisting students and parents to become the librarians. 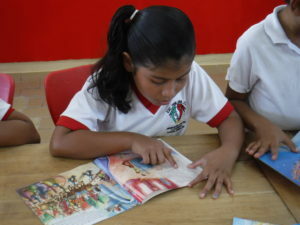 Donations of Spanish language books for children and very beginning English books are always needed and gladly accepted. 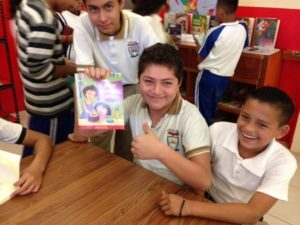 All of us at Leyendo love to read and want to share this wonderful experience with the children of Playa del Carmen. Leyendo means reading in Spanish. 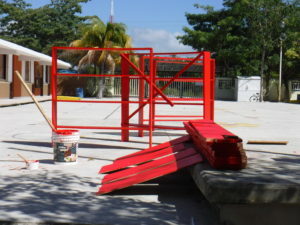 This is the name of a new project being started in Playa del Carmen, Mexico to organize libraries in public schools. 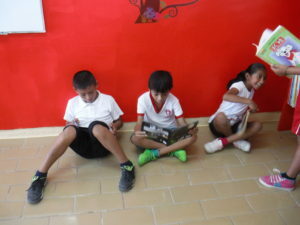 The perception is that reading is not a major pastime in Mexico and we enjoy it so much that we want to share the experience with young learners. So far there are six of us who are interested in the idea. Our job is to gather Spanish language children’s books and look after the libraries once they are created with parent or student librarians, puppet shows and book readings. 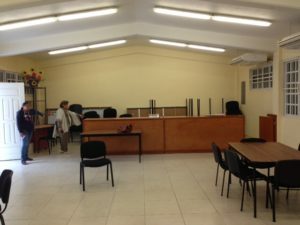 We are partnering with a Canadian organization, Library in a Week, that will do the actual cleaning, painting and shelf construction within a space provided by the school. 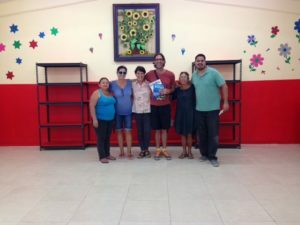 The community center/library in Akumal about 40 kilometers south of Playa, is downsizing it’s book collection and has passed on crates and crates of children’s books. We have gone through them and realize we have enough on hand to open both an elementary school and junior high library. Construction will begin February 5, 2018. 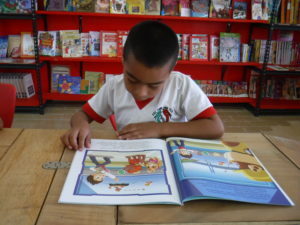 Spanish language books for children will always be needed and can be added to existing libraries or begin a new one. 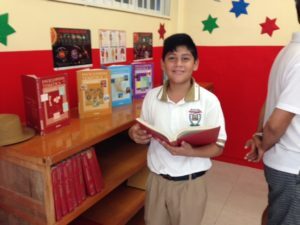 One idea is to approach the private schools in Playa suggesting that students donate books from home which they have outgrown or simply would like to share. We are open to all suggestions and look forward to reading programs expanding beyond measure. There is a Facebook page: Leyendo Playa del Carmen with photos and more info. We can be reached with messages there.